Please visit: http://confirmkavanaugh.com for the latest news and information on Brett Kavanaugh. Here’s the news you need to know on this Tuesday, July 31, 2018. Minority Leader Chuck Schumer wants Democrats to delay declaring for or against Supreme Court nominee Brett Kavanaugh until Republicans prove they have the votes to confirm the judge. 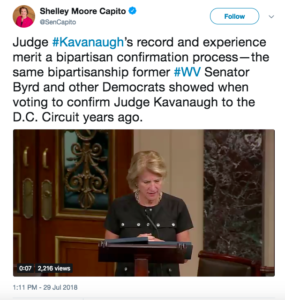 This strategy has been obvious from the start, and its goal is less to defeat Judge Kavanaugh than to protect incumbent Democrats running for re-election. Through eloquent judicial opinions and nuanced law review articles, Kavanaugh has challenged, in particular, today’s increasingly unaccountable administrative state. His uncanny ability to identify fundamental threats to our Constitution’s republican institutions, and to anticipate the Supreme Court’s own eventual response, is exemplified by three cases. Supreme Court nominee Brett M. Kavanaugh won the support of one critical Republican senator Monday and met privately with a key Democrat as he inches closer to securing enough votes for confirmation to the high court.